McKinley's (Michael Ian Black) friends may not realize that while trying to set him up with a girl, he's been having steamy hookups with none other than musical theater producer/total future A-lister Ben (Bradley Cooper) in the back of a supply closet. They end up forming a union of love, sanctified by Camp Director Jeaneane Garofalo. McKinley's friends buy him and Ben a chez lounge to show their support. Gail (Molly Shannon) can't spend a minute without breaking down, as her recent divorce has put her life in shambles. It may take a couple pep talks from the children for Gail to regain her confidence. At the end of the movie, she tells her ex-husband (Judah Friedlander) off and ends up getting engaged to a 7-year old. 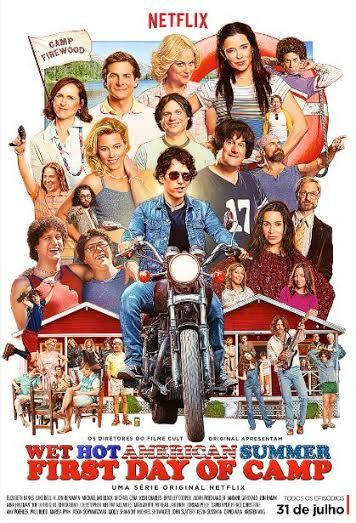 While Katie (Marguerite Moreau) is dating a bad boy cheater (Paul Rudd), the friendzoned Coop (Michael Showalter) can't help but falling in love with his best friend. Of course, they share a passionate kiss in the middle of the movie and Coop eventually professes his love to Katie. Unfortunatley, Coop and the actor who portrayed him have a less than perfect ending, as Coop loses his girl to Paul Rudd and Michael Showalter loses his future spotlight to all his castmates from this film. Ruthless, high-pitched, and screamy, Susie (Amy Poehler) is ready to give it everything she's gotl. After all, being the director/choreographer of a summer camp musical theater performance can't be easy. Beth (Jeneane Garofalo) and Professor Henry Newman (David Hyde Pierce) may have found their match, as the two dorks start flirting in a rather hilarious manner. Once they become soulamtes, Henry and his students find that a piece of NASA's spacecraft has detached and is heading for earth. Long story short, they save the day using a 20-sided die. Poor dude goes through hell and back after his bus breaks down in the middle of nowhere to make it back to camp. Victor (Ken Marino) races back to Abby's cabin in the hopes that she'll hook up with him, only to find her attached to another. Funny enough, Abby (Marisa Ryan) and Lindsay (Elizabeth Banks) end up making out near the end of the film. "You taste like a burger. I don't like you anymore." Need we say more? Reach Staff Reporter Sonia Gumuchian here. Follow her on Twitter here.